Today was another grinder. I got about six hours of sleep, and probably stayed in bed a little too long. My alarm went off at 8:15, but I didn’t get up until 8:28. I had a 9:15 doctor’s appointment, and wound up being rushed while getting ready. I was planning on leaving right from the doctor’s office, so I also had to bring everything with me for the game. My doctor is still a little concerned with my knee, and ordered an MRI. I was planning on leaving for St. Louis tomorrow morning, but I figure I should probably have this done before I go. Tomorrow I’ll be driving to Madison for the MRI and a bunch of blood work, to rule out any possible infections. If everything goes as planned Victoria and I should be leaving for St. Louis tomorrow evening. The MRI is scheduled for 2:30, and I’m keeping my fingers crossed that everything goes smoothly. While talking with one of the receptionists after my appointment, and trying to figure out how everything would work, she asked how I was doing with all the travel and whatnot. I started to answer “Well, there’s only been 18 games……” and then realized I hadn’t changed out the game number sign from last night. I know it’s not a huge deal but I beat myself up a bit. Since I was only in Fort, and my parents live 7 miles away, I decided to go back and get it, then head to Milwaukee. 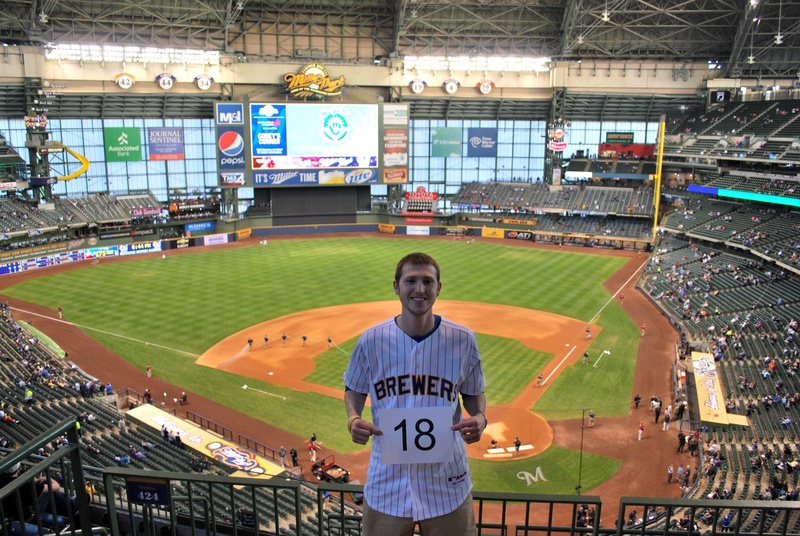 I had originally told Ryan Kartje, a writer for FoxSportsWisconsin.com, that I would meet him at eleven, but I wasn’t quite able to make that happen. 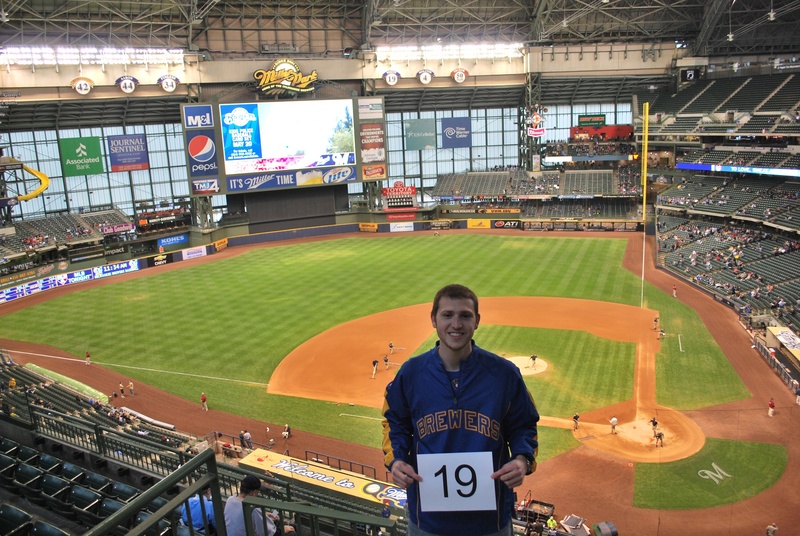 I still made it into Miller Park by 11:20, and we went right to the upper deck. It took some coaching to get the shot that I wanted, but I applaud Ryan for sticking with it. He asked if he did the worst job to date, but I wouldn’t show my hand. He would’ve stood there all day until I was pleased with the shot, so kudos to him. We made it to my seats 30 minutes before game time, and we talked about my story from then until he left after the fourth inning. He’s got a spot in the press box, and work to do, so I don’t blame him. He’ll be writing an article for the website, and it will probably run early next week. He didn’t want to jinx it, but he said if Fox Sports Net likes it enough, they’ll put it on FoxSports.com, and if MSN (who owns Fox Sports Net) likes it enough, they’ll put it on their site. I told him “you better not mess this up!” I was joking of course… maybe. I had a fan a few rows in front of us take our picture before he took off. Ryan is on the left, I’m on the right. Most all the excitement took place in the first three innings, and it was tied 4-4 after the third. Marcum struggled a bit, but only giving up four runs with the number of guys he put on base was impressive. It could’ve been much worse than just four runs. He stranded the bases loaded in the first, and again in the fourth. It was still knotted at four going into the seventh, but the Astros scored a solo run, and added two more in the eighth, to take a 7-4 lead. The Brewers got one back in the 8th on a home run by Hart, and they were able to bring the tying run to the plate in the ninth. After a Gomez triple Braun stepped to the plate, and everyone in the building was hoping for his second 2-run homer of the game. That would have tied it, but he grounded out to third and the game was over. Final Score: Astros 7 – Brewers 5. I did miss one pitch, a 1-2 offering from McClendon to Johnson in the top of the ninth. McClenden doesn’t mess around, and once he agrees on a particular pitch he gets rid of it quickly. I think I was tweeting something when I looked up just after the ball smacked the mitt. I did manage to better my previous streak, which you can see in my stats below. I was also able to pull off another successful bathroom break without missing anything. In the top of the ninth, once the second out was recorded I went up to the concourse and watched the final out from there. I went to the bathroom and then watched the bottom of the ninth from the concourse. With a pronounced limp now, I figured I should try and get a head start on getting to my car. I was hoping the Crew would either tie it, and send it to extras, or win it, and send everyone home happy. It didn’t work out this time, but having Braun at the plate representing the tying run is never a bad thing. The views from the concourses at Miller Park are great. The only downside is that most times you aren’t able to see the scoreboard, but that can be a good thing. If you’re focused on the game and not interested in distractions, then it’s a perfect. This is the view from where I watched the bottom of the ninth, not too shabby. That’s all for now, I may have a post for tomorrow’s off day, but I’m not sure. I won’t be getting into St. Louis until late tomorrow night. If anything it will come on Friday morning. Right now the forecast for the weekend is as follows. Friday; 60 degrees and a 70% chance of rain, Saturday; 76 and a 30% chance of rain, and Sunday; 63 and a 20% chance of rain. This could be a doubleheader situation if that Friday forecast proves to be accurate. I will never get to see a doubleheader at Miller Park because of the roof (which I love). I would like to experience one in my lifetime though, because it lets you experience something that was commonplace back in the day, when they were built into the schedule from the start. Baseball aside, I just want to thank you all for being supportive of this mission. A bunch of people have either joined the registry or are planning on it due to my story, and I couldn’t be happier. Be The Match let me know that my microsite has raised $860, but a high school classmate of mine let me know she donated $100 separately, and her employer matches donations, so we’ve raised over $1,000! I didn’t really come in with a goal in mind, but everything helps, and that $1,000 pays for 10 more people to join the registry. Let’s keep it going! You’re looking at my interpretation of a scrambler, which is inspired by Mickies Dairy Bar in Madison. Mine isn’t exactly the same, as I cook everything in a pan on the stove, and the ingredients are slightly different. 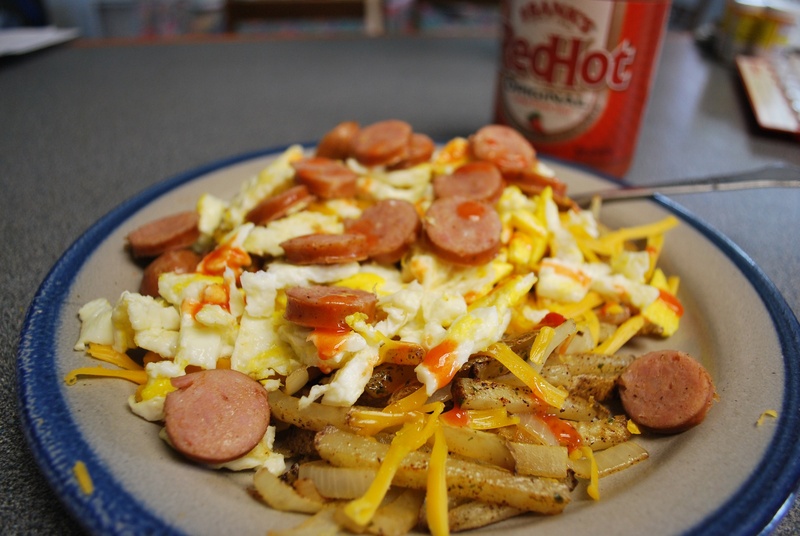 This one included a potato that I sliced “shoe-string style” if you will, yellow onion, one whole egg, two egg whites, sharp cheddar cheese, a polish sausage, and some Frank’s Red Hot. Not a bad way to start your day, your heart might disagree with that statement though. I ate the whole thing, despite it being cold by the time I took the last bite. I spent most of my time before the game trying to get my internet browser to function properly. I was on the phone with Apple tech support for an hour and fifteen minutes, and he tried a number of things, to no avail. He recommended I call my internet service provider, which I did. I talked to the guy at Charter for 30 minutes, and he had no idea. I’m hoping the problem will just solve itself, because I’m going to be using this internet for the next five months when the Brewers are home. I went to the game with Josh, it feels weird calling him that because we typically go by last names, so from now on I’ll call him Crandall. He graduated one year after me, and we’ve been friends since high school. 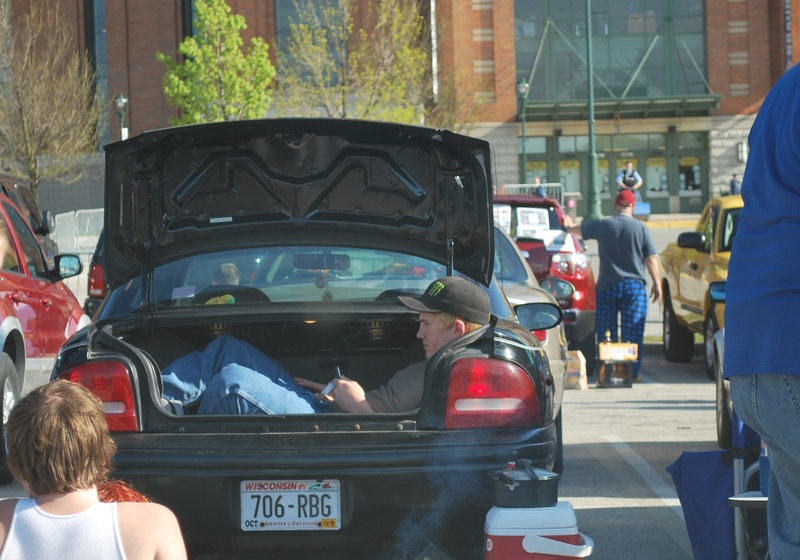 Crandall and I were planning on meeting another Fort Atkinson grad in the general parking lots at five. We got to the preferred lot right on time at 4:45, leaving us fifteen minutes to get the general lot. The tailgate hosts, however, were running late, so we just drank some High Lifes to pass the time. 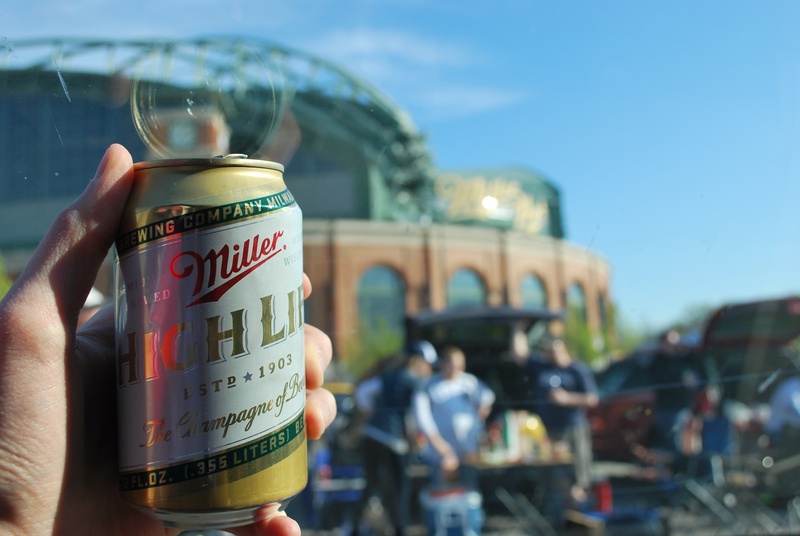 Miller Beer and Miller Park, hard to beat this dynamic duo. Across from us there was something that needed documentation. I’ll be honest, it does look somewhat comfortable, and none of them had chairs, so I guess it makes sense. The tailgate hosts finally arrived and Crandall and I stopped by for a brat, a scotcharoo, and a picture. Below, from left to right, is myself, Katie, Crandall, and Jacob. We all graduated from Fort, Katie and Crandall a year behind me, and Jacob three behind them (I think). Despite their tardiness, the Brat they grilled was delicious, and I thank them for letting us stop by. Katie will be in St. Louis for a few games of the upcoming series, so we may cross paths again. 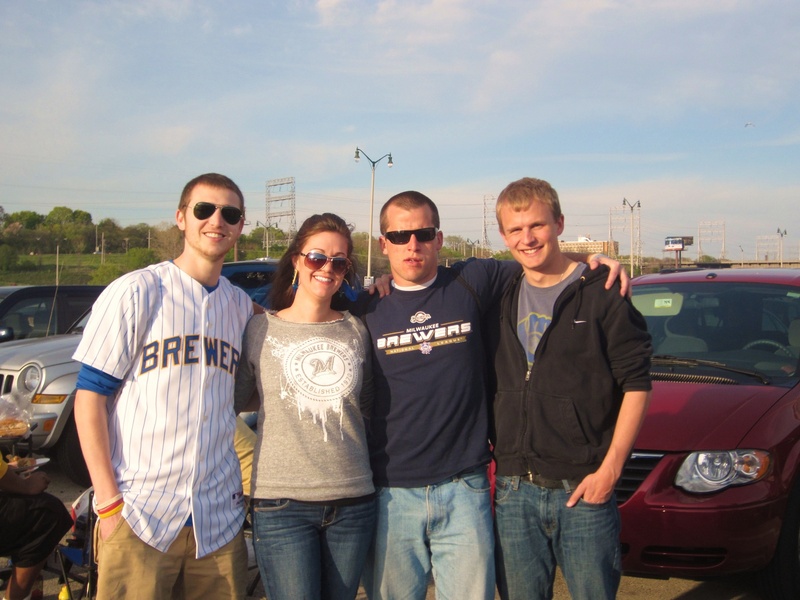 Crandall and I spent about 25 minutes with them, and then headed into Miller Park. We made it inside at 6:35, which is cutting it a little close, since we had to go back to the upper deck for game photo number 18. I hope you guys believe me that I’m going to the games, and not just changing my clothes and moving over a few sections. I promise all the pictures are from separate games (up to this point at least). 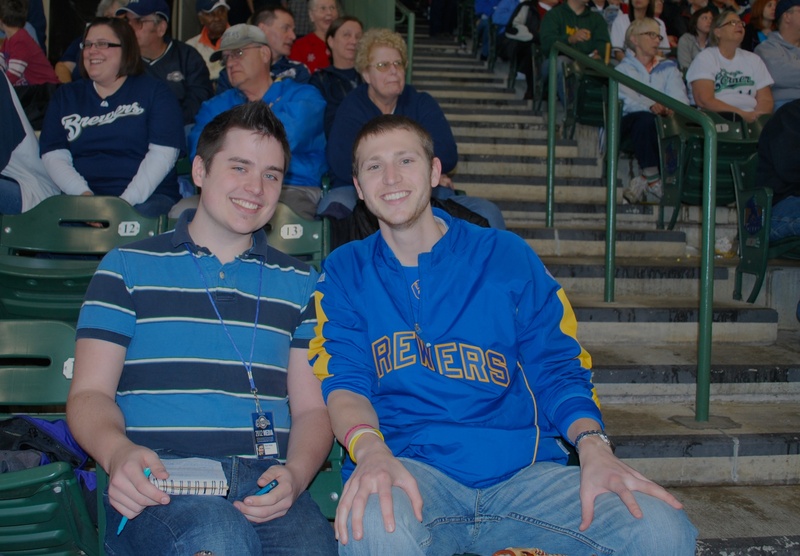 The game was a blast, it could have been the four home runs hit by the Brewers, or the guy behind us. At first he was annoying most everyone with his random outbursts, but they were so ridiculous that Crandall and I couldn’t get enough. I’ll give you a few examples. 1) He would randomly yell “YEEEE-HAAWWW!! !”, for no apparent reason. It was entertaining and annoying at the same time, if that makes sense. I also don’t think he had been drinking, but I wasn’t paying too close attention because I was busy not missing pitches. Another interesting anecdote. 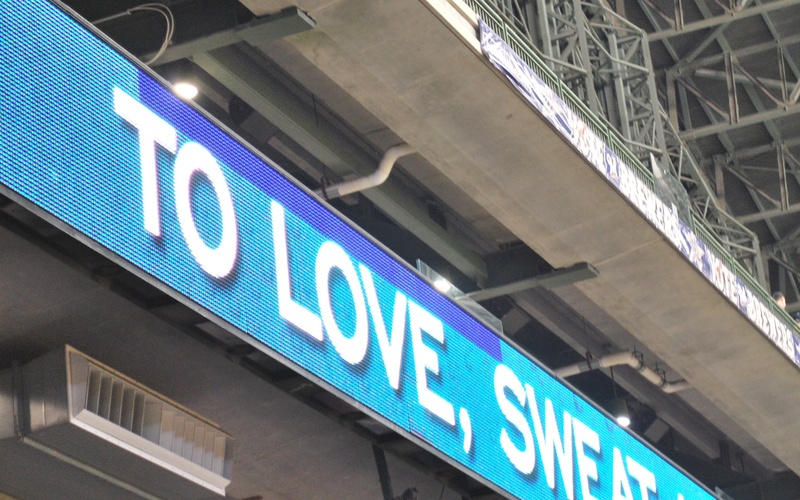 In the 6th inning Travis Ishikawa fouled a ball off that struck the LED ribbon board that goes around Miller Park. 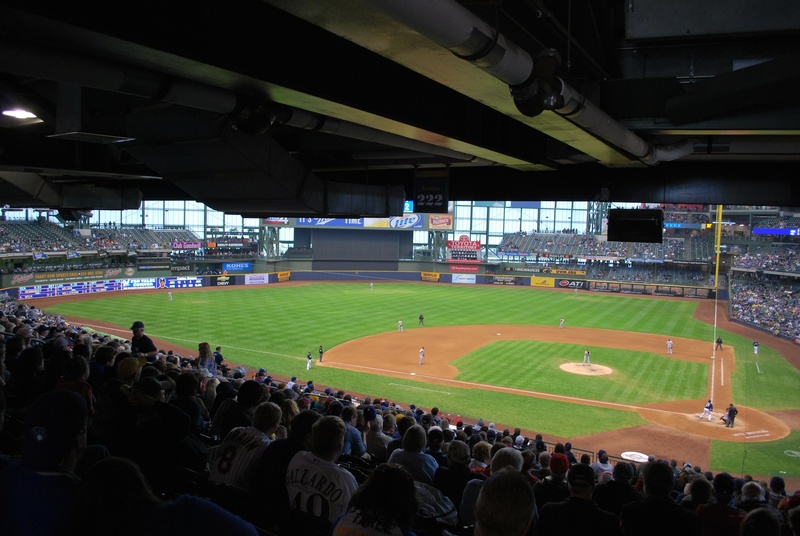 It covers the facade of the club level, or the 3rd seating level for those of you not familiar with Miller Park. This was the result, and I could’ve sworn I saw something fly off after the ball hit. The dark blue strip was never the same for the remainder of the game. Right after it happened, that strip blinked and flashed and then just stayed a different color from what was being shown at the time. I was jokingly upset at Ishikawa and yelled “TRAVIS!!! YOU BETTER PAY FOR THAT, THOSE THINGS ARE EXPENSIVE!! !” I got a chuckle from the rest of the section, so that was fun. I hope I didn’t scare Ishikawa, because that at bat ended in a strikeout, as well as his next at bat in the 7th. 1) Parra discussing what is wrong with the mound. 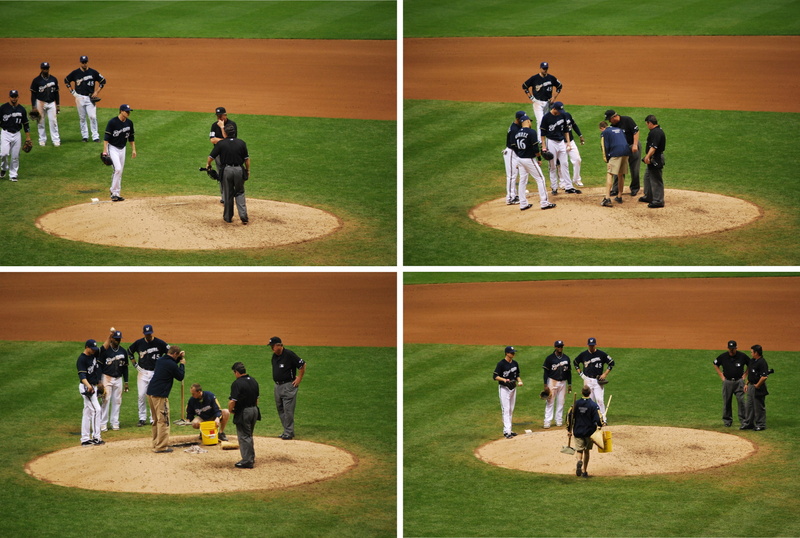 2) A grounds crew member inspecting the dirt around the rubber, while Parra points out what he wants fixed. 3) The grounds crew member returning with tools. 4) Two grounds crew members adding “dirt” and tamping it down. The whole thing took at least five minutes. It took a good minute or so just to get the grounds crew guy out on the field. I have no idea where they usually are during the game, so I won’t judge. It was a little frustrating because the combination of this and other factors caused the game to last much longer than I would’ve liked. Because the next game was only 14 hours away at the time, I had been hoping for a quick two and a half hour game, but it never seems to work out that way. I’ll take the win though, and the Brewers offense appears to be waking from its slumber. Ishikawa, Weeks, Hart, and Gomez all homered, and the crew had 13 hits overall. Hopefully this trend can continue. Final Score: Brewers 9 Astros 6.